Well, that was one of the craziest baseball games anyone has ever seen. A would-be triple that hit the bill of Chris Taylor’s cap and then bounced right to Joc Pederson, a pickoff at second base that looked like Laz Diaz got challenged to an impromptu game of dodgeball, and finally, an extra inning home run derby led to a 7-6 Astros victory, tying the series at one game apiece. If we get any more baseball games like that one, this series will be a classic. But before most of those crazy things happened, Dave Roberts made a decision that seemingly set the wheels in motion. In the top of the fifth inning, the Dodgers’ manager summoned Kenta Maeda from the bullpen to take over for Rich Hill. Rich Hill had thrown just 60 pitches, 42 of them for strikes. Hill had given up just one run, so he wasn’t chased from the game by the Astros hitters. 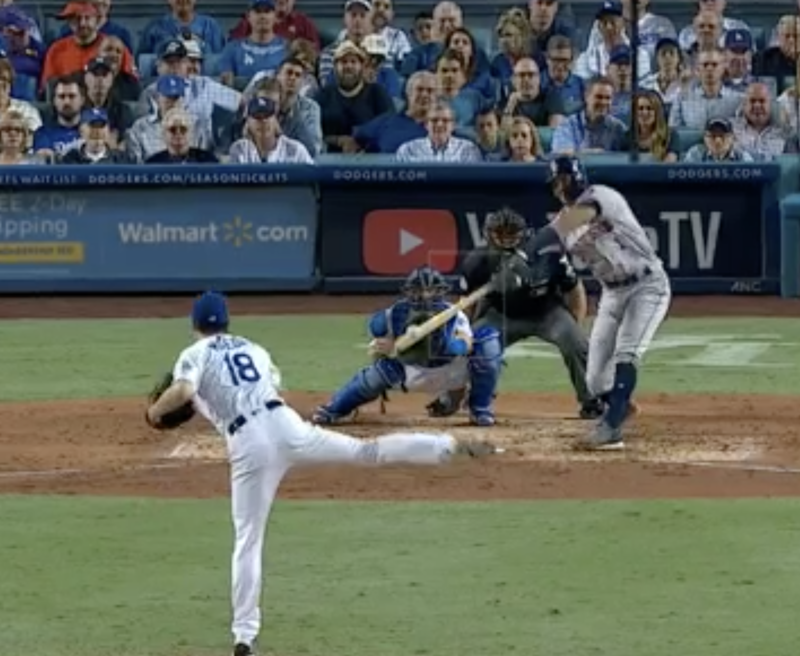 But with the top of the order coming up a third time and Justin Verlander looking like he wasn’t going to give the Dodgers many chances to score, Roberts opted for Maeda to face five consecutive right-handed batters and try to keep the game close. Going to Maeda in the fifth inning pushed the team’s match-up relievers into the game in the sixth and seventh, with Ross Stripling and Tony Watson each only facing one batter in their outings. Brandon Morrow was called in to pitch the seventh inning once Stripling issued a four pitch walk, which meant that Kenley Jansen was asked to get a six-out save, with only Josh Fields, Tony Cingrani, and Brandon McCarthy to pitch if the game went extra innings. Of course, the game did go extra innings, because Jansen couldn’t strand Alex Bregman at second base after relieving Morrow in the 8th inning with a runner at second base, and then he gave up a game-tying home run to Marwin Gonzalez in the ninth. And then Fields gave up two homers in the 10th. And after a miraculous comeback, McCarthy gave up a two run homer to George Springer, which proved to be the decisive blow. If one so chooses, all of that can be traced back to the decision to pull Hill after four innings. The early bullpen usage led to the team running low on pitchers by the end of the night, and the Astros getting clutch hits against guys they probably weren’t expecting to face in high leverage situations this series. Given what came after Hill was removed, it’s very easy to claim that things would have been different had Roberts just done what managers have been doing since baseball was invented, and stuck with his starter until he had no other choice. For basically all of baseball history, pitching changes have been made based with “if it ain’t broke, don’t fix it” mentality. Starters pitch until they get in trouble, then relievers try to get them out of that trouble. Rich Hill was not in trouble but was removed anyway, and the guys who came after him gave up the runs that cost his team the game. And so now Roberts will spend the next 48 hours being pilloried for “overmanaging” or “outsmarting himself” or whatever other term people want to use to disparage the decision to remove Hill after four innings. But when you look at the decision with the information Roberts had at the time he made it, the decision seems perfectly reasonable. Let’s start with the reality that this isn’t new for Roberts. This was Hill’s third start of the postseason; in his first start, he was removed after facing 18 batters over four innings, and in his second start, he was removed after facing 19 batters over five innings. Tonight, Hill again faced 18 batters over four innings. In three postseason starts, Hill has faced exactly one batter three times in the same game. The Dodgers plan for his usage this postseason couldn’t be more clear; he gets two trips through the line-up, and then is pulled as soon as possible. And the first two times Roberts made this decision, it worked out just fine. The Dodgers won both of Hill’s prior two starts. The idea that pulling Hill early had an obvious and foreseeable negative outcome simply isn’t supported by the results of the Dodgers managing Hill exactly in this way in the first two rounds. And given the handedness of the Astros best hitters, changing plans to rely more heavily on Hill in this series didn’t really make sense. When Roberts removed Hill, the next four batters due up were George Springer (165 wRC+ against LHPs this year), Alex Bregman (160), Jose Altuve (164), and Carlos Correa (187). The four of them combined for 586 plate appearances against lefties this year, batting .340/.422/.569 between them. Hill is a better than average lefty, and he’s better against RHBs than most LHPs, but that’s a group where minimizing their plate appearances against left-handed pitchers makes all kinds of sense. Kenta Maeda, who relieved Hill, has been nails all postseason, now throwing in the mid-90s as his stuff has played up in relief. Maeda made easy work of the top of the Astros order in the fifth, then came back out to pitch the sixth. Carlos Correa led off the inning with a single, but, well, here’s what Correa looked like right before and then right at the point of contact. 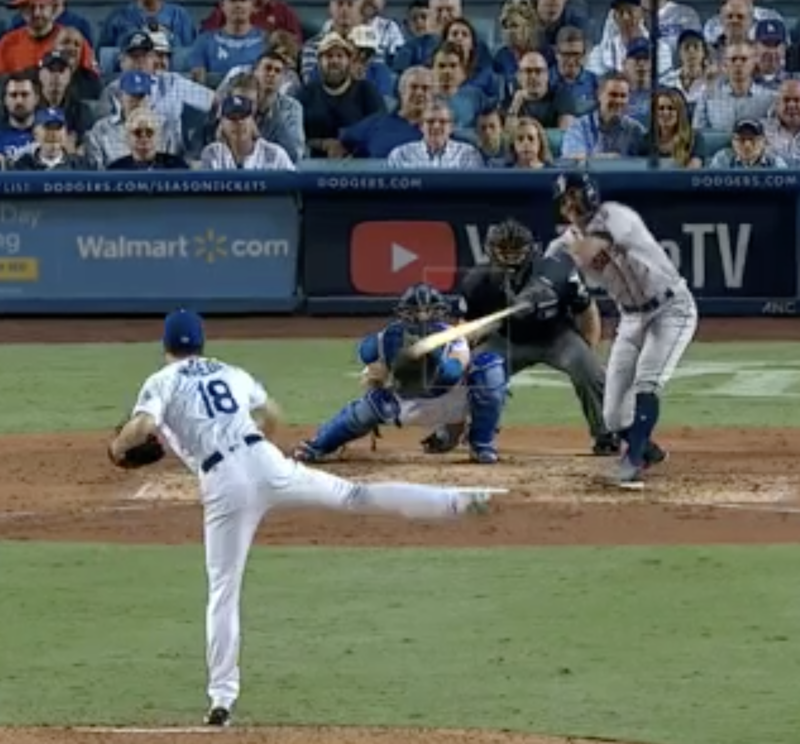 Maeda threw a 2-2 cutter off the plate that Correa lunged after, barely getting the end of the bat on the ball, and hitting it just 86 mph to the left side. Because Correa is a supremely talented hitter, he poked it over Corey Seager’s head for a dinker into left field. With Brian McCann on deck, Roberts made sure he had Tony Watson warm, and after Maeda got one more out, Watson came in to get a one-out double play to end the inning. The immediate results of taking Hill out? The Astros next six batters made six outs. Could Hill have gotten some of those outs without giving up any runs to some of the best right-handed hitters in baseball? Maybe. But if one is going to use the late-game Dodger bullpen results as proof that pulling Hill early was a mistake, the same kind of results-based analysis could be used to “prove” that riding a dominating starter doesn’t always work either. Justin Verlander has been the dominant force in the postseason thus far, and for the first four innings tonight, he looked as good as ever. He went 12-up, 12-down in his first four innings, with only a Chris Taylor walk spoiling a perfect start to the game. At that point, his postseason ERA stood at 1.29. Pulling him at that point would have been unconscionable for A.J. Hinch, and it looked like Verlander was cruising towards another seven, eight, or even nine inning throwback-style outing. But then, in the fifth, Joc Pederson homered. And in the sixth, Taylor walked again, and then Corey Seager homered. And all of the sudden, after four dominant innings, Verlander gave up three runs in the next two innings and was on the hook for the loss. No one is claiming that Hinch should have pulled Verlander before those home runs — he doesn’t have Maeda, Morrow, and Jansen, after all — but it should be impossible to look at how the Dodgers bullpen blew the game, claiming it proved Roberts made a mistake in taking his starter out too early, without recognizing that the manager who stuck with his dominant starter then had to watch that guy give up the lead in the very same game. In the fifth and sixth innings, Verlander showed that riding your dominant starter is no guarantee of success, and that great pitchers give up runs sometimes. It happens. It’s baseball. But we don’t get to just wave away Verlander’s failures while acting as if Jansen’s were somehow written on tablets the moment Roberts pulled Hill after 18 batters faced. Tonight, both an elite starter and an elite closer blew leads. If anything, the story of tonight’s game is there is no perfect way to manage, and that no matter what you do or what they’ve done previously, no one can be counted on to perform in a certain way every game. If Roberts sticks with Hill, perhaps he gets another scoreless inning out of him, or perhaps Altuve and Correa hit their monstrous home runs five innings sooner. We’ll never know. We can’t know. And pretending that it was clear that Hill would have rolled through four guys who just destroyed left-handed pitching this year, the best hitters on the best offense in baseball, is silly. Everything in baseball is a calculated risk. In this case, the Dodgers’ calculations suggest that they don’t trust him to face batters a third time through the order, especially not elite right-handed hitters, when the alternative is a right-hander throwing 96 whose only hit allowed in October came on an 86 mph blooper tonight. And that calculated risk got the ball to Kenley Jansen with six outs to go. And while you don’t want to ask your closer to go multiple-innings every outing, the reality is that Jansen’s track record in these kinds of outings is impeccable. 14.2 innings, 3 hits, 0 runs, 5 BB, 25 K.
19.2, 14 H, 3 R, 1 BB, 28 K.
Those three runs allowed all came in one outing — July 23rd against the Braves — where he blew the save. In the other 13 outings, he recorded 12 saves and picked up a win, and didn’t allow a run in any of those appearances. Tonight, Jansen wasn’t perfect. He gave up a bouncer up the middle that scored his one inherited runner, and then in the ninth inning, he threw a middle-middle cutter to Marwin Gonzalez that got launched into the seats. Like Verlander, Jansen just couldn’t keep runs off the board when he most wanted to. It happens. It’s baseball. Did Roberts manage this game perfectly? No, of course not. Just like Jansen would probably like to have his cutter to Gonzalez back, I’d guess that, in hindsight, he wouldn’t have used Ross Stripling to start the seventh. With Gonzalez and Reddick due up to start the inning, that could have been a good spot to try and get a couple of outs from Cingrani, potentially saving Morrow for the 8th inning and Jansen for the ninth, or at least asking the pair to maybe get seven outs instead of nine. But despite what John Smoltz spent most of the game telling the audience, the decision to remove Hill early didn’t doom the Dodgers. It was a perfectly reasonable decision that, this time, didn’t work out, because the team’s unhittable closer couldn’t hold a two-run lead. Sometimes, good pitchers get beat. Just like Justin Verlander got beat tonight, after looking untouchable for the first four innings of the game. Baseball has changed. These days, starters get taken out before they get into jams, because the preponderance of the evidence shows that it’s better to go to your bullpen too early than too late. It doesn’t mean it’s always going to work, just like riding your starters isn’t always going to work. But despite Smoltz’s protestations, baseball isn’t going back to the days where starters are workhorses who carry their teams through October. The Dodgers had better options than letting Rich Hill face some great right-handed batters a third time through the order. And if this series goes to Game 6, it’s a good bet that Roberts will manage his staff the same way. As he should. Because the Dodgers got here by trusting in the weight of the evidence, and they’re not going to stop just because Kenley Jansen blew one save. We hoped you liked reading In Defense of Dave Roberts by Dave Cameron! The problem is that Hill actually has gotten better this season during his third trip through the lineup. K%-BB% improves, WHIP improves, FIP improves, BAA improves, and BB/9 improves. He has only given up 3 XBH to 102 TBF this year during his third time through the order. Hill also has reverse splits in 2017; he’s been better vs RHB than he has vs LHB. I get it, starting pitchers aren’t going to be the 250 IP workhorses of the 1990’s anymore. But Hill had only thrown 60 pitches and (save for a questionably-scored Chase Utley play) had pretty much shut down the Astros up until that point. We can talk about how the Astros 1-4 hitters are super elite vs LHP, but I feel like it should also be noted that the Astros don’t strike out much, yet Hill had struck out 7 in 4 IP, most notably Altuve twice and Correa once. He hadn’t given up an XBH in his four innings of work. I just feel like one more inning in this instance shouldn’t be met with the utter disdain that this article portrays. Another problem is the risk of overusing Jansen in this series. Last season we saw both Andrew Miller and Aroldis Chapman get pretty much abused during the postseason, and they both gave up some big runs in game 7 of the World Series. I don’t see “utter disdain” at the possibility of letting Rich Hill pitch the 5th inning. Dave is simply defending Roberts decision, not claiming that the other decision would have been obviously incorrect. Roberts took a calculated risk, and Cameron shows that it was reasonable. This doesn’t mean the approach of leaving Hill in couldn’t also be called reasonable. Very much agree here, and to add to it slightly: I also agree with the article when it notes Hill may very well gotten in some trouble, like Verlander got in some trouble, after staying in the game. Which also could be said of the bullpen. But keep in mind Hill getting in a bit of trouble means the ENTIRE bullpen is there to bail him out. While going to the bullpen so early might be a numerically equal or better strategy if things go well, there is the potential hidden cost of running out of people to pitch in big places IF someone gets in trouble. Based on sample sizes, regression, and likely selection bias, I’m close to 100% certain that we shouldn’t believe that either result that you cite in your first paragraph is predictive. The “reverse platoon split” one is fairly easily covered. First, Hill’s count of total batters faced against LHH’ers this year is only 124. Mitchell Lichtman addressed this exact topic at his blog and walked through the mathematical details. Here’s the full post – https://mglbaseball.com/2015/10/13/addendum-to-my-post-on-siegrest-and-platoon-splits/ . His conclusion after going through all the math: “So please, please, please, when you see or hear of a pitcher with severe reverse splits in 200 or so BF versus lefties … remember that our best estimate of their true platoon splits, or what his manager should expect when he sends him out there, is very, very different from what those actual one or three year splits suggest when those actual splits are very far away from the norm. Most of that unusual split, in either direction – almost all of it in fact – is likely a fluke.” This sample for Hill isn’t even 200 LH batters faced – it’s 124. For platoon split, it’s also worth considering selection bias. Hill’s total batters faced count this year is 124 LHH’ers compared to 428 RHH’ers, so 78% RHH’ers. For the NL overall, 43% of total PA’s were taken by LHH’ers. And the LHH’ers that Hill does face almost certainly aren’t just a random subset. A disproportionate number of the LHH’ers who do play against him are going to be ones who are very good hitters and/or have limited platoon splits themselves. To put an example name to it, the Anthony Rizzo’s of the world don’t sit just because the opposing starting pitcher is left-handed. I don’t know of a way to search for the average wOBA of a hitter faced by a pitcher, but my educated guess is that this selection bias has a real impact for a LH starting pitcher who is facing only a bit over 20% same-handed hitters. I don’t have as good a reference for regressing the times through the order penalty, but it still comes down to limited sample size and probably some selection bias. On the selection bias, what happens in a game where Rich Hill gets shelled early? He gets pulled, and probably doesn’t make it to a third time through the order. And, with how aggressive the Dodgers were about using relievers even in the regular season, there’s a real possibility that he only keeps going deep into the third time through the order if he keeps getting hitters out. As for limited sample size and regression toward league averages, consider how unlikely it is that a pitcher has a true talent third time through the order benefit, because the best explanation for it is a combination of not just pitcher fatigue but also batter familiarity. There is evidence that some pitchers are impacted less than others by the times through the order penalty – https://mglbaseball.com/2013/11/11/ttop-and-a-starting-pitchers-repetoire/ – such as those with a broader repertoire. That doesn’t bode well for Hill, however, as he’s basically a two-pitch pitcher. This year he threw 54% fastballs and 38% curve balls. If you regress his numbers, as you suggest, his overall body of work becomes much more impressive. And while I understand that the “third time through the order” is skewed because it doesn’t show when Hill is pitching a bad game, we’re not talking about leaving Hill in when he’s having a bad game. He was pretty thoroughly taming one of the best offenses in history up until he was pulled, and again, had only thrown 60 pitches, 42 of which were strikes. Instead of a broad repertoire, Hill has many arm angles and arm slots that he throws his two pitches from. My whole point is that focusing on one stat (no matter how useful) can take away from the whole picture. Excellent discussion overall ^ but I want to give kudos to Dave T for taking the time to systematically address what seemed to be a cogent criticism. Superbly constructed comment, sir. this is an excellent post (would upvote again) but youre kinda preaching to the choir. i feel like no smart baseball minds actually believe that reverse platoon splits exist. and the people who do believe in them are just going to ignore everything you said above and stick with the raw numbers anyway. They do for a small selection of pitchers, though, like Hansel Robles. And for Hill, his career wOBA for lefties and righties, even counting his horrible early years, is almost identical (.297 vs. righties and .304 vs. lefties). At best, he has no split either way. It makes sense to be nervous about the impending righthanders he was about to face, but there is no evidence that he is worse against righties than he is against lefties. – 29 point normal split is 36 points away from Hill’s reverse split, multiply that by 38% to get 13 – telling us that we expect Hill to have a 6 point true talent platoon split. That is a very modest split, so we’re not far off saying that Hill’s true split is close to 0. In fairness, we can also criticize Dave Cameron some on methodology for focusing on the 1-year numbers for Springer, Bregman, Altuve, and Correa, because batter platoon splits take even longer to stabilize than pitcher platoon splits. If we just use the shorthand that these are “really good RH hitters with around league-average platoon splits” though, they still look like tough match-ups for Hill on the third time through the order, whether his true talent career platoon split is +6 or -7. We should almost certainly also consider that the Dodgers have three good RH relievers in their bullpen (Jansen, Morrow, and Maeda) and should be able to line things up so that these dangerous Astros RH hitters face only some combination of those three for their likely two or three remaining PA’s in this game. Two of those, Jansen and Maeda, have fairly large career platoon splits. Maeda: .331 wOBA vs. LHH, .275 vs. RHH. Jansen: .274 wOBA vs. LHH, .140 wOBA vs. RHH. We regress both of those towards the league average split, but we’re still going to end up with larger than league average splits for those two pitchers. And, of course, Maeda’s overall numbers should be better than his career as a reliever facing hitters just once and with his velocity noticeably up when he’s been pitching from the bullpen. This game very much reminded me of Game 2 of the ALDS that ultimately morphed into a debacle. Both arguments have credibility, but the only reasonable counterargument I can see is that the Astros have been statistically proven to effectively adjust, the third time through. Either way, it’s hard to fault Roberts for going to a pen that allowed 0 runs in the NLCS, knowing he had the next day off.